Jacksonville, NC Bojangles'® Tands, INC. Store #36 - Bojangles'® / Tands, Inc. Nothing beats the fresh, flaky biscuits and tasty Cajun-style fried chicken that Bojangles’® is famous for! Visit our Jacksonville, NC location on Halltown Rd, in the beautiful piney area of Jacksonville. Our restaurant is a favorite of White Oak High School students, and we just might be the Vikings’ biggest fans. 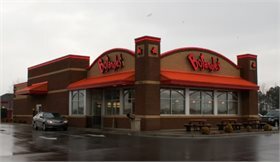 With Bojangles’ affordable food, fast, friendly service and choices for breakfast, lunch and dinner, it’s always Bo Time! Need to grab food on the go? Try the Big Bo Box, which includes iced tea, chicken, biscuits and sides in an easy-to-carry container.